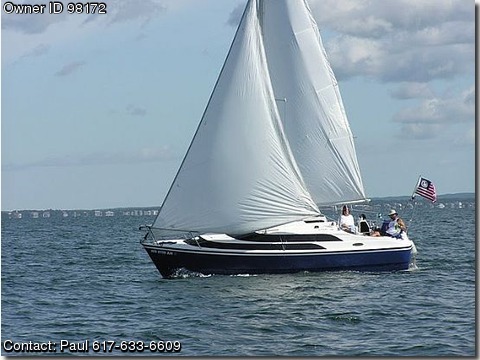 Please contact boat owner Paul at 617-633-6609. Sails NEW (used 1 season) Mainsail, Geneoa with UV strip sewn in (cleaned and serviced), Roller furler with line led aft with cleat for Geneoa, boots installed on spreader ends. Sail handling- Topling lift installed, Main halyard led aft, Custom outhaul with harken blocks, Stock rotating mast with locking pin for trailering or running down wind). Electronics: Garmin 440s GPS Plotter with depth sounder (shoot through hull) included/installed. Standard Horizon VHF radio with DSC - hooked up to ( GPS. Wired remote VHF Mic in cockpit. mast top mounted VHF antenna. Electrical- 8 circuit Blue Sea breaker panel, light control subpanel, 2 Marine Deep Cycle batteries (starting and house) - Group 24, Battery switches with Automatic Charging relay (automatically charges both batteries, but keeps them separated when not being charged! ), 110 Inverter with plug, 12v plugs in cockpit and cabin, Lighting- Standard macgregor interior lights (4), Anchor light on mast top, foredeck light, LED cockpit light under console. Head- Private head location, 5 gallon portable head. Galley- Origo Alcohol stove. 12v fresh water water pump with 50 gallon flexible tank and transom fill. Large cooler with tiedown. 2 piece table, doubles as a cockpit table. Interior- Stock Macgregor cushions , Optional cushion backs included, New custom carpet, storage bins and pockets, Several grab handles mounted throughout the interior, Solar vent fan in foredeck hatch, Stainless Steel hatch holder, 2 fire extinguishers. Cockpit- Custom Stern rail seats installed, Custom rudder control line with blocks to reduce lifting effort ! Automatic kick up rudders, Upgraded steering cables, Large Ritchie compass, Custom made, 2 piece hatchboards with screens and shades (in addition to factory solid hatcboard), Custom transom mesh guard (keep stuff from falling out the back! ), Transom swim ladder, grab rail mounted on hatch. Engine- 50 HP Honda outboard with engine steering linkage. Recent service- Carbs cleaned/synchronized, New imeller, LOF, Fuel filter, lower unit oil, Turn key ready to go!! upgraded throttle cables, 12 Gallon fuel tank. Canvas- Custom padded lifeline covers, 6' Bimini covers the entire cockpit with boot, Custom sail cover, custom sheet bags and mainsheet bag. Mast handling- Mast raising system with brake winch with removable baby stays. PVC roller furler support for trailering, quick release removable spreaders New upper shrouds. Other- mast top mounted windex, Flag pole with flag , burgee flag block on spreader with shroud mounted cleat, 2:1 blocks installed for daggerboard raising, 'Jam' cleat installed for easier daggerboard handling. Anchor- Delta plow, 200' anchor rode, 6' chain. Trailer- NEW upgraded/heavier reinforced tongue section. New tongue strap. 2" trailer ball required. New stainless steel brake line.